After six years of planning, Its Here! 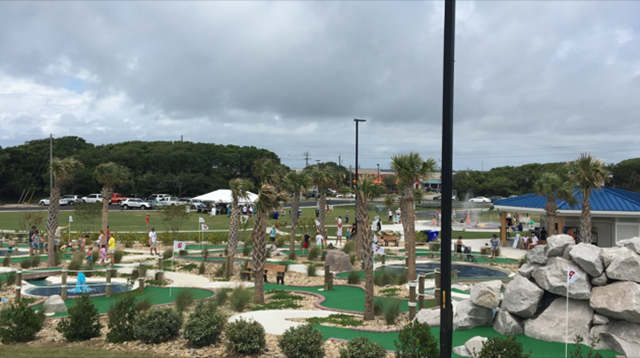 The Atlantic Beach Town Park located at 915 West Fort Macon Road held its Grand Opening on Saturday June 17, 2017. 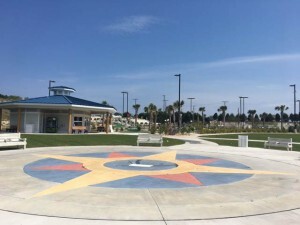 The $1.6 million seven acre park was funded in part by a $600,000 grant from Carteret County; a $65,000 donation from the Big Rock Blue Marlin Tournament; a ten year $125,000 branding rights agreement with Minges Bottling Group/Pepsi; and a combination of Town funds supplemented by citizens’ donations and dedications throughout the Park. Come out and enjoy the Town Park, located at 915 W Fort Macon Road, across from Bojangles and the Atlantic Station Shopping Center. 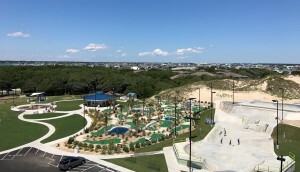 This park has a large playset, a swingset, merry-go-round, basketball goal, miniature golf, splashpad, skatepark, and more for big and little kids to enjoy. 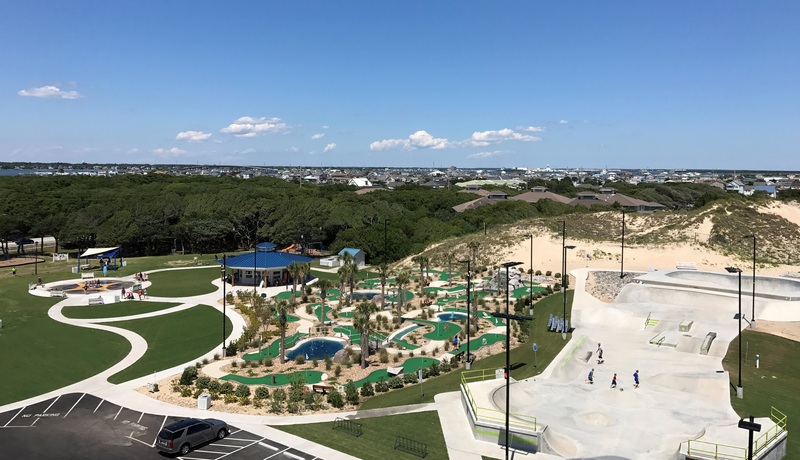 The splashpad and mini golf/concession amenities are open during the summer season, closed in the off-season, and will reopen in the spring. If you and your family are looking for a shady place to enjoy a picnic, please visit the well-lighted shaded picnic site beside the playground equipment. As an added bonus, the park features free WIFI! 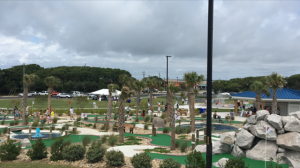 The Town Park includes an 18 hole mini-golf course with concession stand and restroom facilities. The mini golf course and concession stand are open daily during the summer from 10 AM – 10 PM with mini golf costing only $5 per person (age 6 and under free!) – the best family friendly rates on the island! Cash and credit cards accepted. The mini golf/concession amenities are open during the summer season, closed in the off-season, and will reopen in the spring. 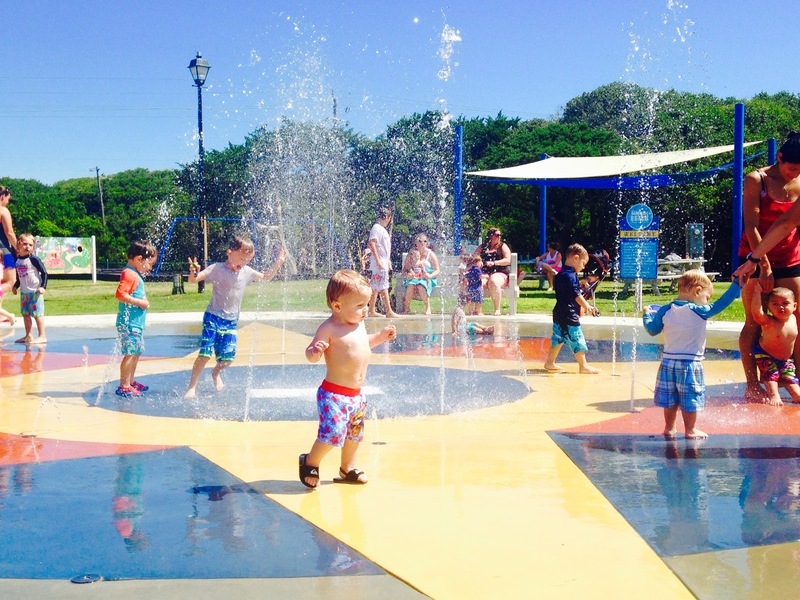 Make sure to bring a bathing suit and visit the splash pad, which is an interactive water play fountain ideal for children of all ages. 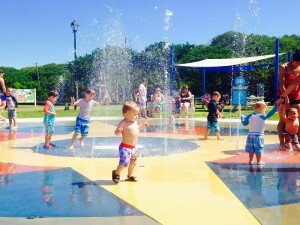 The splashpad is open during the summer season, closed in the off-season, and will reopen in the spring. 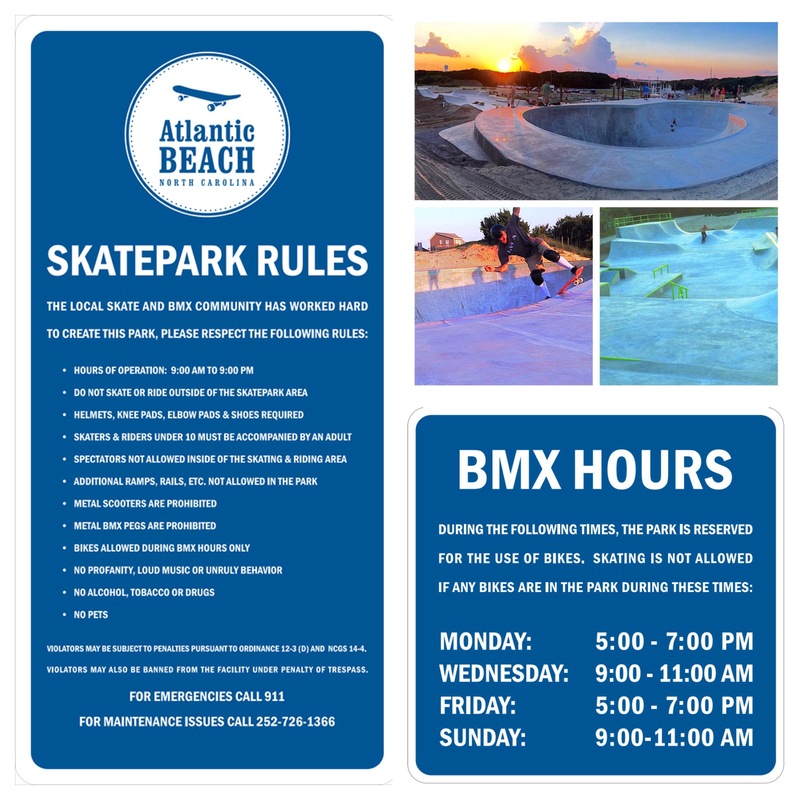 The Town Skate Park is located at the Town Park, 915 W Fort Macon Road, and is free to the public. 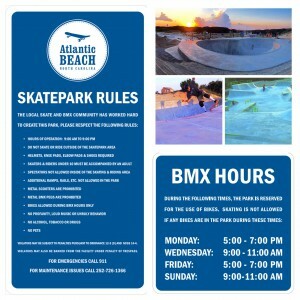 The skate park hours are daily, 9AM to 9PM (or dusk, whichever is earlier). Riders under 10 must be accompanied by an adult. Pursuant to NC General Statute, all skaters and riders must wear helmets, elbow pads, and knee pads. 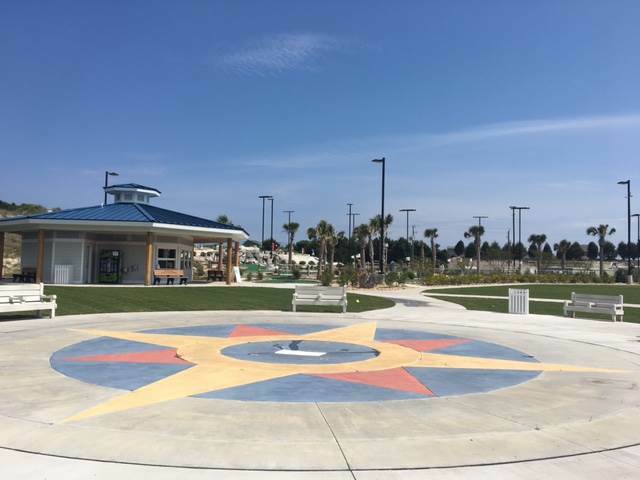 Please visit the Town’s main beach access at the “Circle” with public parking, beach access, and restrooms. Staff works hard to keep it maintained and clean for our residents and summertime visitors with volleyball courts, three lifeguard stands, and a swingset by the old Pavilion parking lot. This is the site for the many of the summer activities planned. This is also the location of the Carteret County Parks & Recreation sponsored and coordinated summer annual beach volleyball tournaments and beach run series. Atlantic Beach is excited to offer a Junior Lifeguard program to our citizens and visitors. There are four different sessions held annually. Registration forms will be available at Town Hall, starting March 1st at 8AM. Each registration form should have its own payment (cash or check only). If paying for multiple children, each child will need to be registered and paid separately. Spaces per session are first come, first serve – no reservations. Parents/guardians may wish come prior to 8AM on March 1st and get in line outside of the Town Hall front door as sessions tend to fill up quickly. Parents/guardians should know their session preference when they arrive to assist in the registration process. We will post the registration form online in early March when the consistent walk-ins slow down. For planning purposes, the 2019 dates for each session are below. For more information, contact the Atlantic Beach Fire Department. The Town of Atlantic Beach partners with Carteret County Parks & Recreation to offer Adult Co-ed Beach Volleyball on the Circle annually each summer. Register online or contact AnMarie Ivester at 252.808.3301 or anmarie.ivester@carteretcountync.gov for more information. Carteret County Parks & Recreation hosts the Annual Beach Run Series each summer. Races start from the Atlantic Beach Circle. Register online or contact AnMarie Ivester at 252.808.3301 or anmarie.ivester@carteretcountync.gov for more information. Movies are free to the public and will begin at dusk (approximately 8:30 p.m.) on Wednesday nights. Movies are shown at the AB Town Park, 915 West Fort Macon Rd. Free Live Music on Thursdays at the AB Town Park, 915 West Fort Macon Road!